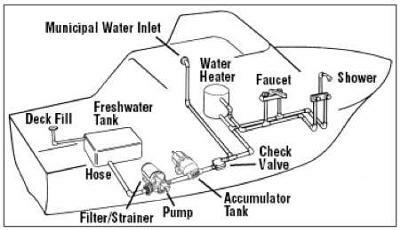 Houseboat Plumbing 101, we'll look at water pressure, tanks, showers, filters, heaters, and pumps, as they are all popular words, and all common parts of a pressurized freshwater system. When it comes to plumbing, it can sometimes be confusing, yet with a simple diagram, and some basic troubleshooting skills, you too can become the Master Plumber in your houseboat. Recently, I had one gentleman ask me a question, "I changed my fresh water pump and still don't have much pressure in shower. Any ideas?" and I wanted to do a Plumbing 101 to help boaters troubleshoot some of the common issues. As you can see by the pressurized freshwater system diagram above, you can visualize and follow the path along some of the major components. Not an overly complicated system, yet can be confusing without a diagram. To troubleshoot some of the low pressure issues, first verify that all of the waterlines in the water system have no leaks, as this is a surefire way to lose water pressure. In the case of the shower having much less pressure, check the shower head for obstructions, as there maybe some debris or calcium buildup in the nozzle openings. Many of the faucets have stainless steel screens that are screwed onto the end of the faucet. The screen filter can become clogged with debris and other impurities. You would want to verify the condition of the filter or strainer near the freshwater tank. If you have a check valve in the system, make sure that it operates properly. the "out" side of the freshwater pump, to verify that there is adequate water pressure being sent from the pump. If unsure about the water pressure in the system, you can compare the pressure when the municipal water line is connected to the houseboat, this way you can isolate if the problem is between the deck fill, and the municipal water line. When it comes to pumps, if you need replacement parts, or if you need to buy one, there's many freshwater water pumps models available, and it depends on the GPH (gallons per hour) required for the amount of faucets or fixtures that you need to supply. If you have a deeper need for more detailed knowledge about each component, have a look at this pressurized freshwater system tutorial. You may also be interested in reading our article on Boat Parts - are there freshwater cooling bilge pumps on houseboats? Lastly, hopefully some of our readers will share and post comments about houseboat plumbing tips and ideas, or any water pressure issues and experiences. Feel free to use the "Click here to post comments." link found near the bottom of this page. Clogged Houseboat Heads - flushes fine, but not out? We have a 78 Carl Craft houseboat with a head that is not attached to a black water tank. It appears to flush fine but when we are out on the water, we notice that it backs back up into the bowl. We do not use toliet paper in this head. What can we do?